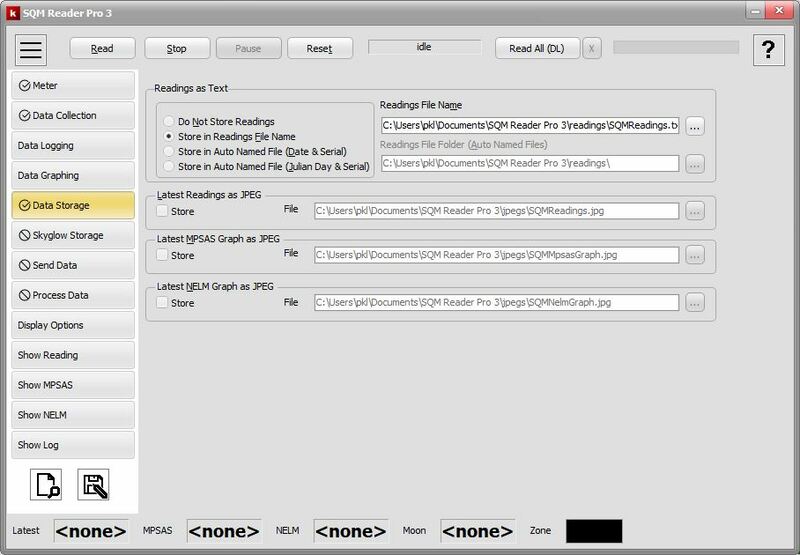 Knightware released an update to SQM Reader Pro 3 on 17 March 2018. See Knightware's calendar of events. The only software like it anywhere! 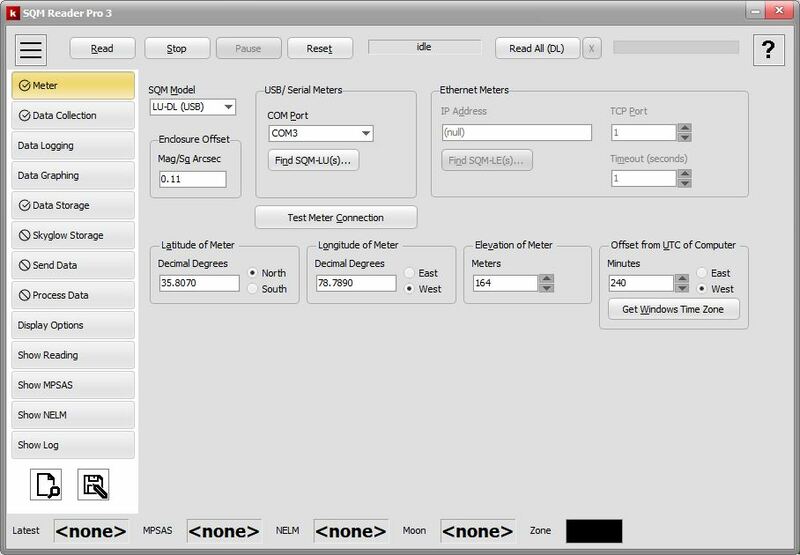 SQM Reader Pro 3 for Windows gives you the tools you need to get the most from your Sky Quality Meter model LE, LU, LU-DL or LR. 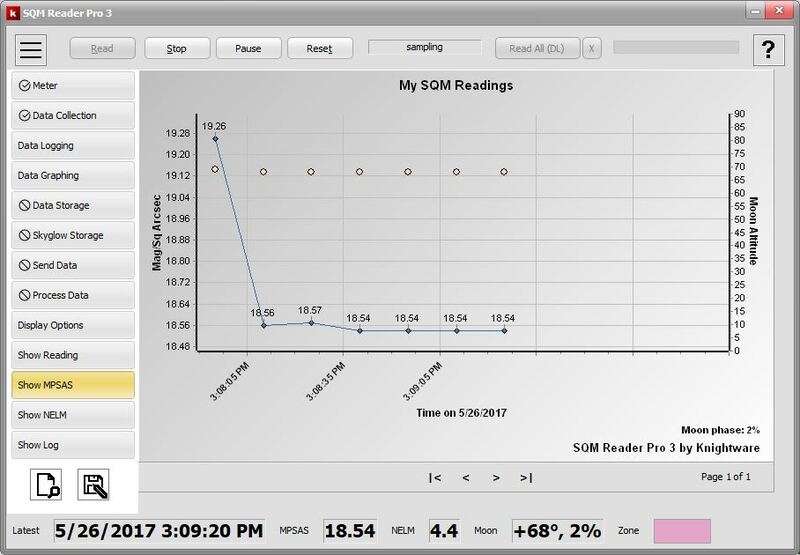 From initial setup of the meter, to nightly data collection, to enabling sophisticated statistical analysis, SQM Reader Pro 3 makes understanding the light pollution in your evening dark sky easy, accurate and convenient. Experienced users: click here to see new features in version 3. 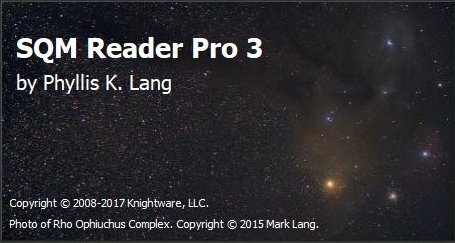 SQM Reader Pro 3 uses your computer's Ethernet connection to read dark sky data from the model LE, a USB port from models LU and LU-DL, and a 9-pin serial port from the model LR. You can read dark sky data from the model LE over a network or use an Ethernet crossover cable to read it directly. You can read dark sky data from models LU, LU-DL and LR directly via the appropriate cable. SQM Reader Pro 3 does not calibrate the Sky Quality Meter or alter its accuracy. 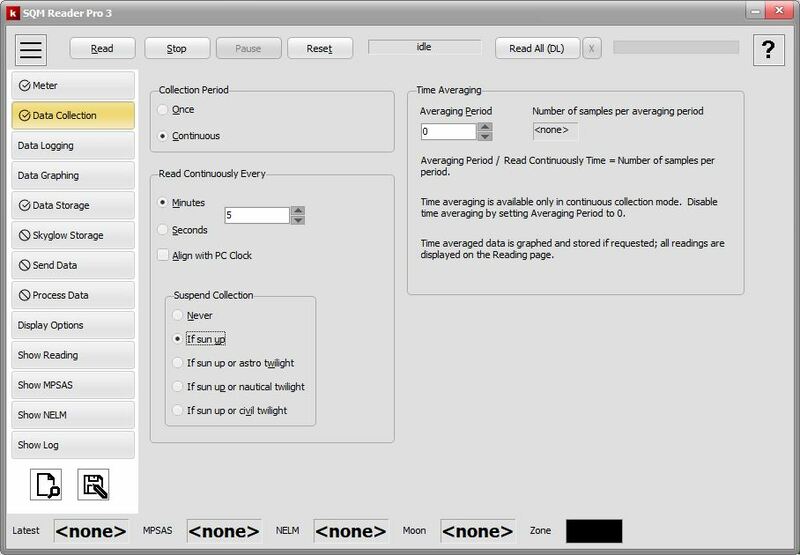 If you are an imager, a serious deep-sky observer, or you are conducting a dark sky study, SQM Reader Pro 3 is for you. Click to see who is using SQM Reader Pro. The Skyglow Standard file format was defined in 2012 by an international group of light pollution researchers, including Knightware. 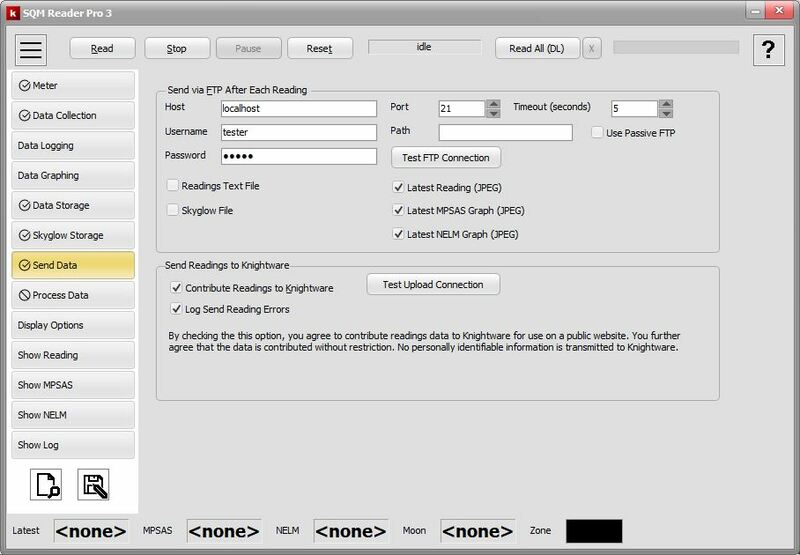 The standard file format allows researchers to exchange darkness measurements regardless of their research interests. The format is supported in SQM Reader Pro 3. You can read the international standard definition here or you can read some background information at the Skyglow Standard web page at International Dark-Sky Association. Click the Order Now button below to order SQM Reader Pro securely using express checkout. You may also purchase any of our products securely using the full checkout by visiting the Knightware Store. Both checkout procedures allow you to pay with major credit cards, debit cards, Paypal and more. SQM Reader Pro software has a 30 day money back guarantee. Sends data to Knightware's SQM Readings Map page. PC with Intel Pentium CPU or later (or a fully compatible and equivalent CPU) . 1GHz or faster on Windows 7 or 8. XGA (1024 x 768) or better with DirectX 9 graphics device with WDDM 1.0 or higher driver. Sky Quality Meters are available from Unihedron or any of its dealers worldwide. SQM Reader Pro is protected by United States copyright laws and international treaties. All copyrights are owned by Knightware, LLC and/or Phyllis K. Lang, and are registered with the United States Copyright Office. SQM Reader Pro is a trademark of Knightware, LLC.